What connects Adani, Facebook and the Australian election? Money. 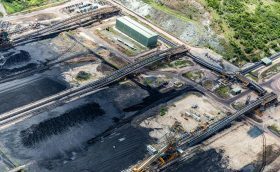 Vast sums of money that Adani will lose if the huge coal mine in the Carmichael Basin in central Queensland does not go ahead (which would scuttle other, smaller tho still huge, coal mines in the area), and vast sums Adani will make if the coal mine happens. This included discussion factories in eastern Europe that would generate fake news and then generate fake discussions, both positively and negatively slanted towards Trump’s election. This is all available on the public record, and was mentioned in the US probe into possible foreign meddling in the US elections (like the US do is virtually every election in the world!). The Adani empire/conglomerate consists of companies that are vertically integrated. Adani Australia mines and exports coal on Adani ships to Adani-owned ports in India to be burnt in Adani power stations. This has a few points of interest. One is that Adani India can decide what it pays for Australian coal to the point where the coal miner may never make a profit and never pay any tax, and most likely will have no money available to rehab the mine sites at the end of their lives. Another is that the 20-30 Adani coal fired powered stations do not run on the low quality Indian coal, but rather require higher quality Australian coal that is found in the Carmichael Basin. Having built these power stations, paid the required baksheesh, and no doubt wanting to expand power generation in power thirsty India, getting the Adani mines on Australia up and running becomes vitally important. How important? Well, conservatively the value of the Indian power stations must be upwards of $5billion, assets that may be stranded if the mega mine does not happen. So you can see there is quite a bit at stake. How much is it worth to Adani to make sure that the mine goes ahead? How much in the way of donations found its way into the coffers of the National and Liberal parties over the past weeks leading up to approval announcement just prior to the setting of the election? How many Adani employees suddenly donated $3-5000, how many family members all of a sudden could afford to make a political donation? Speculation of course, but we will possible never know until it is too late. I imagine that if it cost Adani $100m to get the approvals and open the mine it would be a good investment. Adani could quite easily learn the lessons of Trump and run a massive campaign of fake news, disinformation, fake news groups, with no money flowing directly into the LNP coffers and therefore not subject to declaration or even acknowledgment. Affecting the Facebook feeds of a targeted group of people, such as working class areas worried about climate change and who are also concerned about electricity prices and the rumours of recession that ‘some Facebook pages’ are spruiking if Adani is rejected, is very simple and direct, and totally deniable for the politicians. The ability of Adani to influence the Australian 2019 election, dubbed the ‘climate election’ in a virtually anonymous way represents a very clear threat to the democratic processes. It also represents a very clear threat to the future of life on this planet. This is not the time to ‘take prisoners’!